Do You remember?..Single season sitcoms..
Cover of SINGLE SEASON SITCOMS, 1948-1979, by Bob Leszczak. Over the last few months on the Facebook page I've been posting a number of relatively rare opens and closes of sitcoms, game shows and other vintage shows from a YouTube poster with the username of "Gilmore Box". That name is taken from a character played by Bob Sweeney on "The Brothers" a sitcom that lasted a single season on CBS-TV in 1956. "Gilmore Box" is aka Bob Leszczak, who has an affinity for what are known as "Single Season Sitcoms". Those that had high hopes for success , but because of either a bad time slot, behind the scenes problems, or just lack of quality, lasted just one season (or less). 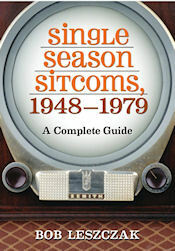 Leszczak is a former radio host (Bob O' Brien) that has put out a great resource that details these sitcoms in alphabetical order, with a lot of previously unpublished detail, such as production company, producers and directors, and other information that puts out the history of these shows in marvelous detail. The best parts of the book are the pictures..Many unpublished before, and interviews with actors that took part in the sitcoms. Names such as Jackie Joseph Lawrence, Sherry Alberoni, Tab Hunter, Lee Meriwether and a host of other actors that were interviewed by Bob for the project..
Another angle is Big movie stars that were thought to be a shoo-in for success (Jimmy Stewart) only lasted one season in their sitcom. While this is not a book you would read start to finish necessarily, it is a fantastic resource for shows that many of us had forgotten about, if we remembered them in the first place..Bob has done a great job here, and I highly recommend this book..
.. All these and many others are featured in the book..Again, Highly recommended..